George and Ellen Aitchison first daughter Ann Margaret was born on the 21st May 1848 at 6 Pitt Street St Pancras. George shows his occupation now as an Undertaker. The family home is now in Pitt Street, which joins Charlotte Street at one end and John Street at the other. 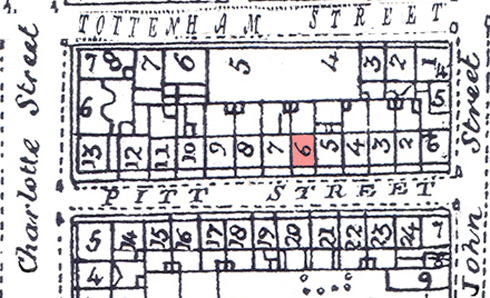 The drawing below from 1838 shows the junction of Pitt Street with Charlotte Street. The Aitchisons lived about halfway down on the left hand side. 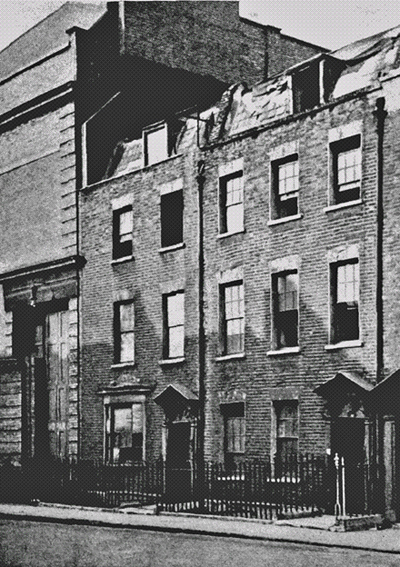 The houses on the northern side of Pitt Street were demolished when the Prince of Wales Theatre in Tottenham Street was rebuilt and enlarged. It became then The Scala Theatre which operated until the 1960's when it was damaged by fire. Then the area was redeveloped for office accommodation. 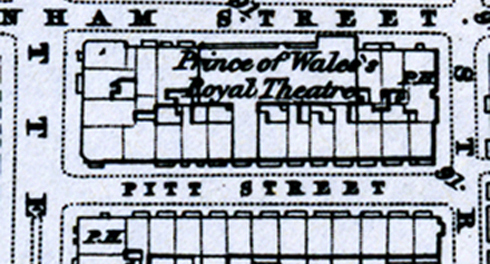 Pitt Street was later renamed Scala Street after the Theatre, and John Street became part of Whitfield Street. The two maps date from 1800 and 1870 and show the changes over that period. The photograph shows numbers 2 and 3 Pitt Street joining on to the back of the enlarged theatre. The stage door is visible to the left. We believe that this style of house would have been the same as number 6 where the Aitchison's lived.